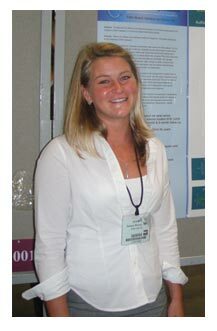 RCRI's first research fellow, Jessica Dreyer, from the University of Miami, presented an abstract about the extended effectiveness of ranibizumab injections on managing retinal venous occlusive disease. Dreyer presented RCRI's findings at the annual meeting of the American Society of Retina Specialists. During the study, more than 90 patients with retinal venous occlusive disease, who were treated with ranibizumab injections, were reviewed by Dreyer and the RCRI team. The results of the clinical trial concluded that fewer ranibizumab injections were highly effective in the long-term management of retinal swelling in patients with retinal venous occlusive disease. In addition, these patients maintained their initial medication-reduction gains throughout an extended period of up to 20 months.